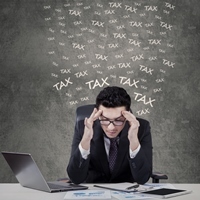 Q: I started working as a sole trader at the start of 2014, do I need to file a tax return? What do I need to do? A: You are liable for tax from the day you start trading however the way the self-assessment system works means you do not file and pay your tax until October of the year after you start trading. It is your obligation to register with Revenue and file a tax return. You can claim some relief for working at home but only expenses related to the business, and the same for work travel expenses – but only travel related to the business, not for example your journey from home to your normal place of work. If you miss the deadline you may be subject to a surcharge, 5% where the return is late but filed within two months of the deadline or 10% where the return is filed more than two months late. The surcharge is calculated on the tax charge before taking account of any payments on account. Interest can also be applied by Revenue if you do not pay your tax liability on time, it is calculated at 0.0219% per day (approximately 8% per year). Completing your first tax return can be daunting, if this is your first time to file a tax return or if you would like some help in filling your return contact TaxAssist Accountants.